In this section you will find links to websites that help you learn and practice new computer skills, such as using the mouse, using a laptop touch pad, or understanding the parts of a computer. You may also schedule an appointment to meet with a librarian for a one-on-one tutorial. Contact the library at 767-2780, or email nsmreference@gmail.com. ﻿﻿﻿﻿For the novice, learning to use the mouse is the most important first step. 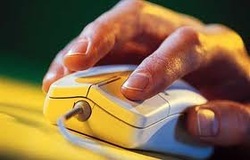 Being comfortable holding the mouse, moving it, and clicking its buttons are absolutely essential skills. You can't start, open, or close a program, an email, or a website without these skills. (1) For the true novice, the Mousing Around tutorial is a wonderful place to start. It provides basic explanations for step-by-step learning and practice. 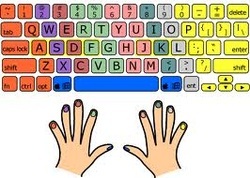 Go to this tutorial by double-clicking (with the left mouse button) on this link, sponsored by the Palm Beach Public Library: http://www.pbclibrary.org/mousing/intro.htm **HINT: You can only learn so much at any one time. After learning about "scrolling," stop for now. Repeat the tutorial if you like, or try the "Mouserobics" tutorial shown in number (4) below. It's a great review of what you've just learned and a chance to learn the same material in a slightly different way--always good for reinforcing skills. (2) A great follow-up exercise, called Mousercise, can be found at the end of the Mousing Around tutorial. If you want to complete this exercise at a later date, you can repeat the first tutorial--good practice-- or you can just go to link shown here, also sponsored by the Palm Beach Public Library: http://www.pbclibrary.org/mousing/mousercise.htm? (4) To complete your mouse training-- or to refresh you skills at any time -- play any of the Mousing Around games available at this Palm Beach Public Library-sponsored site: http://www.pbclibrary.org/mousing/games.htm? If you are learning to use the touch pad on a laptop for the first time, these links offer step-by-step instructions, photos and videos. Navigating around the computer screen using a touch pad can be difficult at first, whether you are new to computing or are used to using a computer mouse. Once you get familiar with the controls, though, and practice the basic navigating, scrolling and selecting techniques, you'll be surprised by how quickly using the touch pad successfully becomes second nature. (2) Use this link to view or download a PDF instruction sheet with screenshots, demonstrating how to navigate, scroll and select. This page takes a few minutes to load. What's the difference between a desktop and a laptop? What's a peripheral? Where does this cable go? Is this hardward or software? How does a computer work, anyway? If you'd like to learn more about computers themselves and to understand computer jargon, then the "Computer Basics" lessons, interactives and videos available free through GCFLearnFree.Org are for you. Scroll down the table of contents and click on any topic that interests you. Or, try the buttons across the top to choose the format in which you want to learn. "What is a Computer?" Video - click here. Need practice keeping your fingers on the "home row"? Need to speed up your keyboarding (what we used to call "typing" in the old days)? Here are some sites that will give you both instruction and practice. Email 101 introduces you to email, where to get email service, and how it works. Email How-To: Step-by-step, interactive tutorial showing how to use an inbox, send email, open or add attachments, reply to one or reply to all, and how to forward messages. ​Beginning to Browse the Internet with Mozilla Firefox Web Browser. If you have a library card issued by North Smithfield Public Library, ask about free access to Universal Class courses on all Microsoft applications. Click the link on our homepage and log in using your North Smithfield library card. Everyone can access the GCFLearnFree.Org site tutorials to walk you through the basics of Microsoft applications. Here, you can learn or review the task ribbon; learn how to enter, edit and modify; use proof-reading and editing tools, create hyperlinks, save and print and more. Microsoft Word 2007 - step-by-step introduction and guide. Tutorial and videos available. For some of the lessons, you will want to download the sample letter provided (once at the link, click on "example" and then click "OK").